A short while ago Donna left a comment asking about tips to get the family grocery bill down. 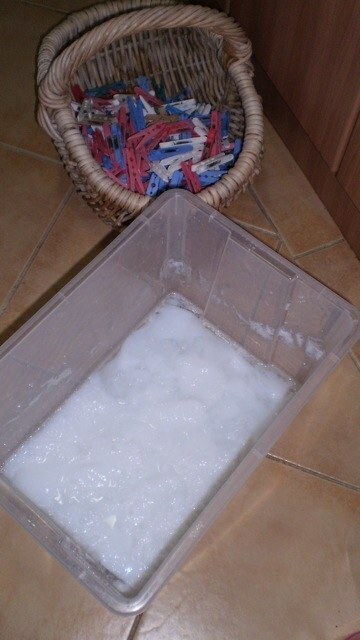 Making your own laundry soap is a great way to save a lot of money! 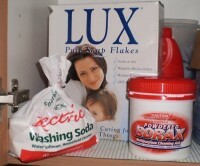 Add the Lux flakes (or grated soap) to 1.5 litres of water in a saucepan. Warm over a medium heat until the soap is dissolved. Add the Borax and washing soda, continue stirring until dissolved and mixture is just starting to thicken. Pour liquid into a large container or bucket, and add water to top up to 10 litres. Leave to cool and set into a gel, then store with a lid on top. It only takes about 10 minutes, and gives you 10 litres of clothes washing gel for under $2. Compare that to 10 litres of shop-bought laundry liquid! To use, simply scoop out a small amount (about 1/4 cup – or just use an old washing powder scoop), mix it with a little hot water to dissolve, then add it to your washing machine and wash with cold water. After a few days the gel may separate (a bit like a custard left in the fridge!). This is fine – just mix it up with an egg-whisk until it’s nicely blended again. If you want to get all fancy, you can experiment with adding essential oils to the gel mix to give it more of a fragrance. Or even better, just add a drop or two of the oil to the machine as the wash cycle starts – this way you can use different fragrances for different loads. Some people like to use a soothing oil like lavender for bedsheets, and a more invigorating oil like citrus for sports clothes. Tea tree oil and eucalyptus oil have antibacterial properties that are supposed to help with hard-to-shift odours. To help shift stains, rub a bit of the gel into the stain before the wash. 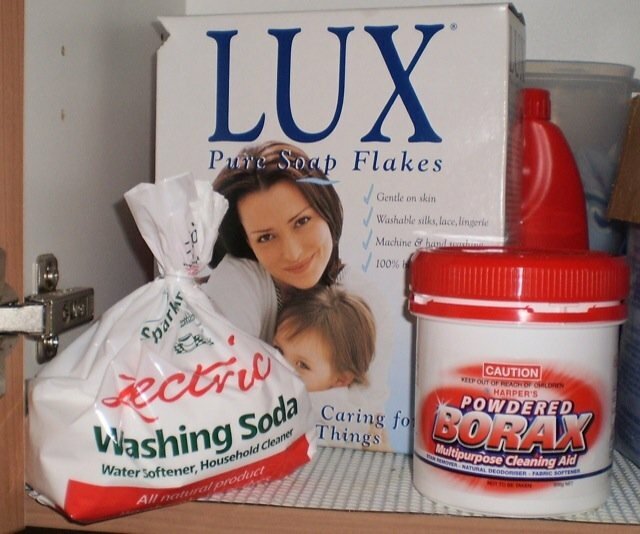 If you prefer a powder to a liquid, you can mix soap flakes, borax and washing soda in the same quantities as above but without the water, and store in an airtight container. Shake well before each use, and add 2 tablespoons per wash.
Another great tip is to use normal white vinegar as a fabric softener. You won’t smell it on the clothes, but it will leave them nice and soft. And it’s cheap – 2 litres costs less than $2 and lasts many loads. I’ve also read that if you put your clothes through the dryer (What? You don’t use the sun to dry your clothes?!) the vinegar helps reduce static cling, meaning you don’t need to use dryer sheets. I’ve read that using soap like this in a washing machine can lead to a build-up of soap residue. To prevent this, you can run the occasional wash with a commercial laundry detergent to break down the residue. If you’re using vinegar as a fabric softener, though, you won’t even need to do this! @Greenfumb: Let me know how you go! I think Borax is in the laundry aisle at most supermarkets, probably near Draino etc. It’s also an effective environmentally-friendly ant poison – mix it with a bit of honey or sugar and water, and put it out in jar lids where you’re having ant problems. They take it back to their nest, and it wipes out the whole colony. Just be careful with using the grey water from this mixture on the garden. Borax contains boron and too much of that stuff will make your soil effectively toxic. There are a few boron loving plants such as passionfruit, but the general rule with boron is that a little goes a long way (as it is a trace element). Also vinegar as a dishwasher rinse aid works extremely well. I have been using this for over a decade now. @Jason: Good point about using the greywater. One option (admittedly not ideal) is to dump the wash cycle water down the drain, but use the rinse cycle water for the garden so you’re only getting a tiny amount of the Borax. I have also seen someone recommending that you can substitute bicarb soda for the Borax, although I haven’t tried that myself. The Borax is basically there as a gentle bleach, so you could probably leave it out if you like. And yeah, vinegar as a rinse aid in the dishwasher is great! Told my wife about your recipe and she said she hasn’t seen washing soda at the supermarket. Has anyone seen it there? My wife also said she probably wouldn’t get around to making detergent, with her busy schedule and all. We’ve been using green household products when possible but definitely lean towards things that are also convenient. We heard about a new detergent called grabgreen from a friend and ended up buying it on their website after doing some research. It’s a neat product (check their website, http://www.grabgreenhome.com) because the detergent is packed into these clear packets that dissolve in water. There is less waste with the packaging too since it comes in a small pouch. We’ve found it to be really effective too. So this is a great alternative for people like us who like convenient (and green) products! @Trevor: Washing soda is in the laundry aisle. I’ve seen it in all three of the supermarkets I’ve been in recently (was checking because I was going to post this recipe!). She probably just hasn’t seen it because she hasn’t had reason to look for it. I don’t pretend to know your wife’s schedule, but it really only takes about 10 minutes to make up a batch of this laundry soap, and that gives you 10 litres – probably enough for about 40 washes. And it’s way, way cheaper than even the cheapest commercial alternative – let alone the premium-priced ‘green’ products. Still, that GrabGreen looks like an interesting product for busy people. Darren, I’m wondering, can I add some additional fragrance oils, such as the Lavender or Sandalwood into the homemade soap? @Wilson: Sure you can. It’ll add fragrance to the whole batch, though – it might be better to just add a drop or two into the wash each time so you can vary it for different loads. I’ve been making this sinice last year and have to say I am really happy with it (with 4 y.o. twins too, so our washing is pretty heavy duty!) I don’t like the borax though, so I leave it out, and it hasn’t made any difference that I can tell. My kids have sensitive skin and this costs me under $2 for 10 litres, compared to over $50 (for 10 litres equivalent) for sensitive supermarket liquid – no contest – I will never buy it again. Also, the lectric soda helps avoid soap build up in the machine. Just a tip if I may – from my aromatherapist MIL – if you add aromatherapy oils to the mix, wait until it cools a little otherwise it evpaorates and loses a lot. I find eucalyptus to be the best scent…. mmmmm…..! @mountainwildlife: Great to hear! The borax is apparently only a bleaching agent, so it doesn’t hurt to leave it out especially if you dry the clothes in the sun. Can’t argue with the economics of this laundry soap, either! Good tip about adding the oils, thanks. Do you have top loader or front. I do this without the cooking and adding water to get the gel, and I don’t think it’s as economical as the gel, but worry about the gel in the front loader. Love your feedback. @Hannah: We’ve got a top loader. This mix doesn’t seem to suds up too much, so it might be OK in a front loader. I think I’ve read of other people using a similar recipe in front loaders, but I can’t recall where I saw that. You could try one load with a mop on standby just in case :-). This is the recipe I have been using for almost a year now! I’m in the USA but the recipes come out the same. I add about 500 ml vinegar to every batch of soap I make and my machine hardly ever has that musty smell that I would often get from commercial brands! I figured up the cost of my soap without the oils and it costs less than one cent a load! Just an update – we’ve now been using this recipe in a front-loader for about 18 months, with no problems at all.